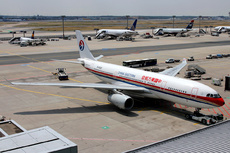 A China Eastern Airlines Airbus A330-243, registered B-5821, operating flight MU777, departed Kunming, China, for Sydney, Australia. On board were 14 crew and 213 passengers. The flight crew descended from FL370, advised cabin crew of the descent, and illuminated the seatbelt signs. The cabin crew manager announced to the passengers the descent into Sydney and to fasten their seatbelts as the seat belt sign was illuminated. The cabin crew checked whether the passengers fastened their seatbelts. At FL230, about ten minutes after the seatbelt sign was illuminated, the aircraft experienced severe turbulence lasting about 30 seconds. The flight crew commenced the turbulence checklist following the quick reference handbook. As the turbulence had stopped and the flight instruments and engine indications were normal, the flight continued to Sydney.